i am going to confess something right now that may offend more than a few people, but here goes. i have never really been a fan of pumpkin pie. i know it's almost sacrilegious to admit to such a thing, especially this close to thanksgiving, but it's true. i love a lot of other pumpkin desserts, and i love all those warm, holiday season spices -- cinnamon, nutmeg, ginger -- but mixed with the cold custard filling of a pumpkin pie, it's just never done it for me. but the one thing that could change all that? caramel. lots and lots of sweet, salt-flecked caramel. the simple things really are sometimes (almost always) the best things. 1. make the almond crust: in a medium bowl, combine all-purpose flour, almond meal, and salt. mix dry ingredients together, then drop in the vegetable shortening and butter. if the fats seems to have been warmed too much during this process (or if they were never all that cold to begin with) put the whole bowl in the freezer for 5 minutes before moving on to the next step. 2. work the fats into the dry ingredients using a pastry blender, fork, or your fingers (always my favorite method) until everything begins to clump together and starts to feel like wet sand. add ice-cold water, one tablespoon at a time, until dough begins to come together. i needed 5 tablespoons of water for this dough, but feel free to adjust the amount as needed – the dough should easily come together into a ball, but shouldn't feel overly wet or sticky. 3. Form dough into a disc, wrap in plastic cling wrap, and refrigerate for 30 minutes to 1 hour. 4. when you're ready to roll out the crust, make sure to roll it out about 2 inches larger than your tart pan – so if you're working with a 9-inch tart pan, aim to create an 11-inch circle of dough. spray the pan with nonstick cooking spray and gently transfer the dough to the pan, carefully pressing it down into the bottom and up against the sides of the pan. trim any excess dough hanging over the edges. 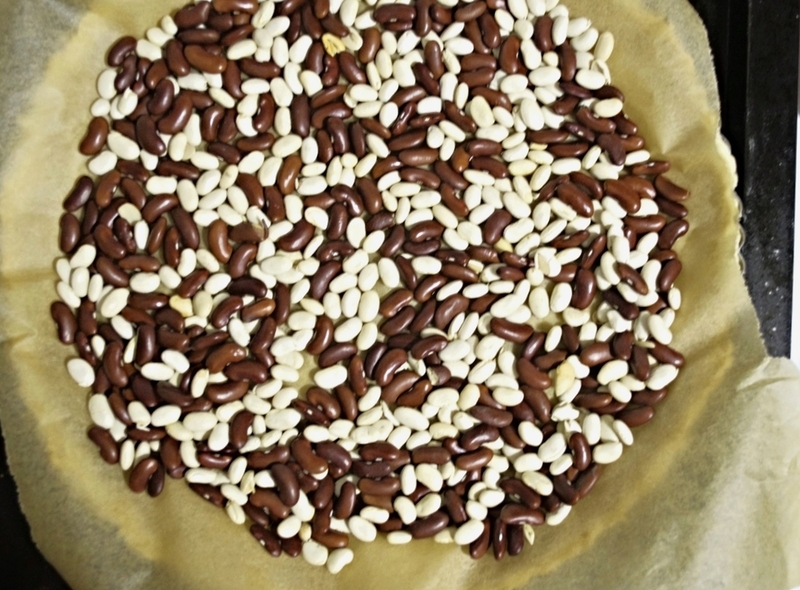 5. place a piece of parchment paper on top of the dough, then add dried beans or pie weights (as pictured above), and bake crust 17-18 minutes at 375°F. allow crust to cool for about 25-30 minutes. 6. make the caramel topping: to a small saucepot, add sugar Heat over medium-low heat, allowing sugars to melt (try your best not to disturb or stir them until they've started melting in order to avoid clumping or crystalization). Once melted, turn heat down to low and add butter; stir until it’s completely melted into the caramel. (be careful here, because the caramel will bubble and sizzle quite a bit during this step). slowly whisk in heavy cream and vanilla. allow caramel to cook another 4-5 minutes. stir in sea salt and pour into a clean container; set aside to cool and thicken. 7. make the pumpkin filling: add eggs, granulated sugar, and maple syrup to a large bowl or bowl of stand mixer. Beat eggs and sweeteners until thoroughly combined (about 2-3 minutes). add vanilla, cinnamon, ginger, nutmeg, allspice, heavy cream, and puréed canned pumpkin. mix another 2 minutes until thoroughly combined. 8. pour pumpkin filling into the cooled crust and bake another 60-70 minutes at 350° F, or until set. once baked, allow the pie to cool to room temperature, then cover with plastic wrap and chill in the freezer for at least one hour. 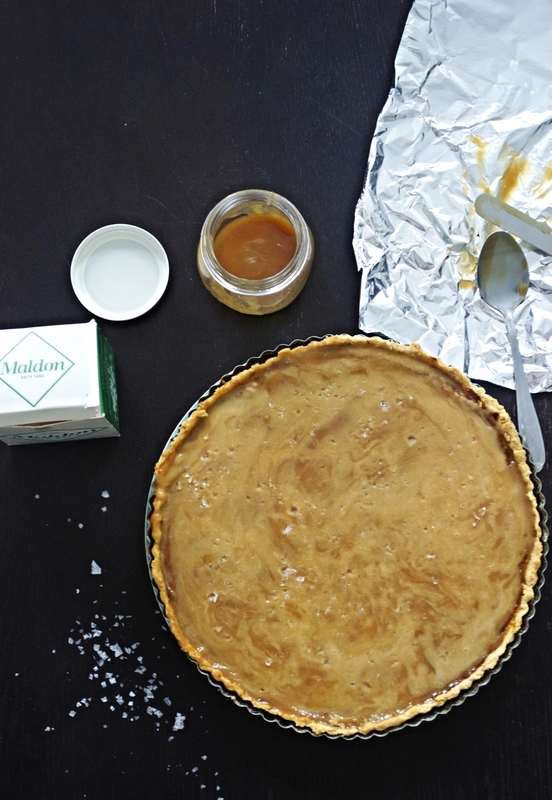 once completely cold, pour on caramel topping, smooth and distribute evenly over the surface of the pie with an spatula (i like an offset spatula for this task) and sprinkle the surface with more flaky sea salt. keep in the fridge or freezer (the pie will be easier to cut when cold). *tip: before cutting the pie, coat your knife with nonstick cooking spray to prevent the caramel from sticking.